Almost 40,000 people may have been displaced by militia arson and looting in Sudan's Darfur region, according to new data obtained by AFP on Tuesday. 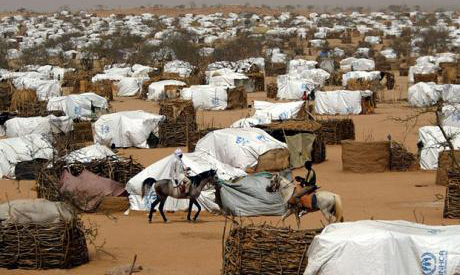 More than 19,000 arrivals have been recorded at two camps for displaced people near the South Darfur state capital, Nyala, the International Organisation for Migration (IOM) said. That is in addition to an estimated 20,000 whom the UN's World Food Programme (WFP) on Monday said fled to safety at Saniya Deleiba, a village about 35 kilometres (22 miles) from Nyala. A WFP team was to travel to the village on Tuesday to determine exactly how many are in need. Mario Lito Malanca, IOM's chief of mission in Sudan, told AFP that his agency registered 5,473 displaced in Kalma camp and another 14,015 in Al-Salam camp. The new surge of displaced adds to the strain on agencies that were already struggling to assist almost two million people uprooted by 11 years of rebel-government war in Darfur, and a surge of inter-Arab militia fighting last year. The African Union-United Nations peacekeeping mission in Darfur (UNAMID) said Monday that it had reports of villages burned, looting, and civilian casualties. However, UNAMID said Sudanese authorities had not allowed peacekeepers into the conflict zone, despite an agreement with the government which says Blue Helmets have freedom of movement. Sources in the area told AFP that "all indications" are that so-called Rapid Support Forces, militia that in the past have backed government operations against rebels in South Kordofan, are behind the latest violence.